Broke...We've all been there a time or two. A low paycheck or just way too many bills coming out at one time. In cases like this, money is more than tight and you're left with next to nothing. A lot of times this means sitting at home with nothing to do until the next paycheck arrives. This makes for stressful and boring times my friend. However, you don't have to be bored anymore. . 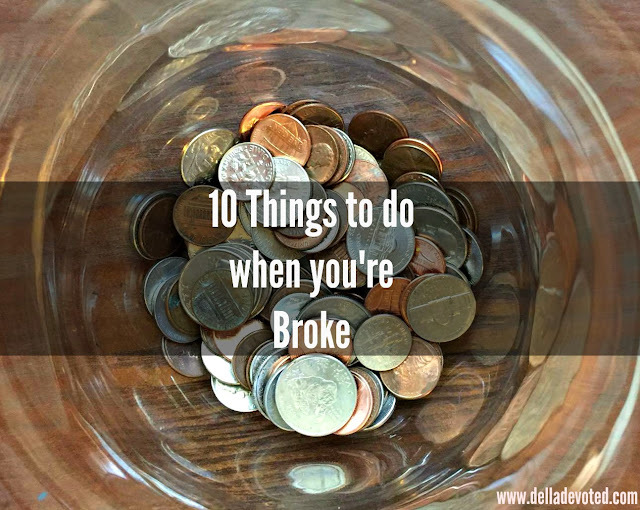 I have been broke more times than I care for and in times like this you have to get creative and find free things to do, so I have compiled a great list of things to do when you are broke. 1) Go to a Park- The park never gets old if you have children. They can have hours of fun there! 2) Have a movie night at home- Make popcorn and pick out a new movie or show that you have been wanting to watch...This is why I love Netflix and Amazon Prime, there is always something new to watch on there. 3) Go for a Scenic Drive- My favorite time of year to go for a drive is during the Fall. I love looking at all of the Fall Foliage. God's coloring book really is breathtaking. 4) Check your local events and attend a Festival that is going on. I really enjoy just walking around the festivals just to see everything and everyone. About an hour from where we live, there is a chili tasting festival that I have been wanting to attend. 5) Go to a Car Show- In our area there are always car shows somewhere at least once a month. This is great for the car enthusiast like my husband. 6) Visit a Free Museum- There are a lot of free museums and those never get old. It's always nice to see all of the talent. We have a local center that showcases local art including photography and it's always so nice to see how talented everyone is. 7) Host a themed dinner- Invite friends over and have everyone bring a different dish. I really enjoy Mexican themed dinners. 8) Visit a Friend's house for game night- We like to do this especially during winter months. We try to make it a weekly thing. 9) Have a Girl's Night- Everyone can do manicures and pedicures for each other. 10) Be out in Nature- Go for a walk or hike. Just enjoy all the creation that God hath made. Nothing makes you feel better than going for a nice long walk. It relaxes your body and mind.